Schlock Mercenary - Hello, It’s Been A While, Is This Thing On? Hello, It’s Been A While, Is This Thing On? It’s been a while since I blogged about anything. For those of you awaiting movie reviews, I apologize. I’ve been busy with a great many things, and kind of forgot how to leave the house. Building this kind of thing probably doesn’t help in that regard. The work surface and the wooden cabinets are new. Sandra did all of the sanding and staining, and they’re gorgeous (and a delight to touch.) Also, all those wooden cabinets light up when I open the doors. 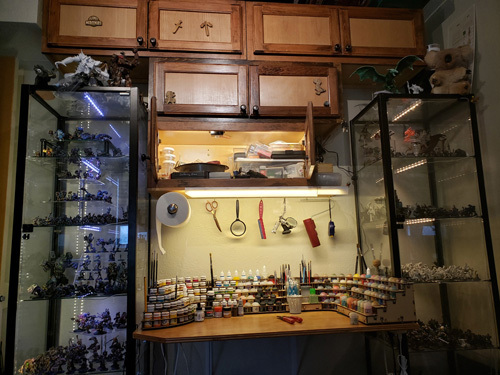 It could be argued that this is a huge expenditure of time for a hobby station, but I did this as practice for when we install illuminated cabinets in the kitchen we’re about to remodel. As anyone who has hung cupboards can tell you, practicing this kind of thing is key, because there are mistakes you only learn not to make by making them. Fortunately for my office, I’m a fast learner.